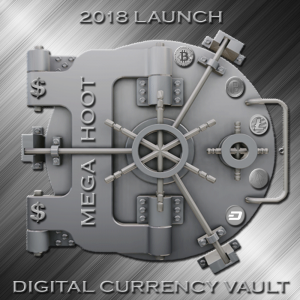 Megahoot, LLC, a technology and cybersecurity company, announced today that it has completed the first phase of the Megahoot Vault “The Vault”, a platform that will be a part of a true ecosystem for securing, utilizing and creating additional value for digital assets globally. The Megahoot ecosystem will consist of a highly secure escrow system that will allow businesses globally to conduct transactions safely, securely, transparently via blockchain technology and cost effectively. The Vault has a feature which allows coin holders to place part or whole of their coin holdings in a highly secure digital safety deposit box. In addition global businesses will be able to utilize the escrow system in lieu of letters of credit to conduct transactions, this will reduce the transactional cost by a wide margin for import/export, manufacturing, commercial real estate and many other companies. The escrow system was designed to become an asset for both local and global businesses of all sizes. The Megahoot Vault is a part of an ecosystem that is efficient, scalable and flexible in order to easily onboard various digital assets, businesses, institutions, individuals and digital merchants. The Megahoot ecosystem will also onboard directly developed and indirectly developed ecommerce, gaming, entertainment and other platforms that promote the usage of the digital assets within the Megahoot Vault. The Vault will give real estate firms globally the ability to digitally execute documents and final agreements that would be a permanent transaction within the Pecu Novus blockchain. This breeds transparency, clarity and irrefutable evidence of each and every transaction. The buyers and sellers will also have the ability to use the Vault to place digital assets in escrow for a transaction, which would reduce fees incurred and the need to segregate funds for a predetermined amount of time. The escrow system allows for coins to be locked for a specified amount of time, from 1 day to 10 years, depending on the need of the two parties. Megahoot will be collaborating with various developers of digital assets and platform that use digital assets to conduct transactions in order to unlock the full potential of digital assets on a global scale. The Megahoot Vault currently supports Pecu Novus and Megahoot Coin digital assets and will be onboarding a number of other digital assets such as bitcoin as the developers provide the coding needed to be included in the Megahoot Vault. Megahoot is a Technology Company focused on secure private collaboration platforms for business and personal use, incorporating ephemeral messaging, high security, use of cryptography and secure mobility. Products being introduced in 2018 include a digital vault for highly secure holding of various cryptocurrencies, loyalty tokens and information on/off the Megahoot Network. With the use of blockchain technology Megahoot will be venturing into various industries from smart homes to health care and more utilizing its blockchain technology platform that will allow corporations globally to create dedicated blockchain networks for their businesses for everything from accounting, logistics, supply chain management, security, education and much more. There will also be the ability to create loyalty tokens and coins aka cryptocurrency on the Megahoot Network. Megahoot LLC is a wholly owned subsidiary of Falcon Global Acquisitions. For more information on FGA go to www.falconglobalacquisitions.com . For more information on Megahoot go to www.megahoot.com.